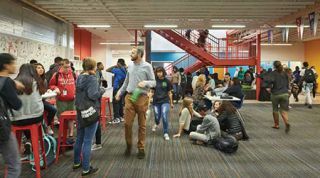 While Google Apps for Education, Microsoft productivity tools, and—latest to the scene—Amazon Inspire, have made inroads into the educational arena, Facebook’s partnership with Summit Public Schools reaches new heights in connecting with students and changing the way educators approach personalized learning. In 2000, hundreds of Silicon Valley parents and community members came together to reimagine the American high school. Summit Public Schools has since expanded into eight innovative schools around the Bay Area. Students log onto the Summit Personalized Learning Platform to access their entire curriculum, pick and choose projects, and selfdirect their learning, all at a comfortable pace. Facebook CEO Mark Zuckerberg visited Summit in 2014. Inspired, he offered Facebook’s engineering expertise to help turn the Summit Personalized Learning Platform into a dynamic, scalable platform that could provide schools across the U.S. with the resources they need to bring personalized learning into the classroom. For the last two years, Facebook engineers have been working with Summit educators to make the platform an even more powerful tool that is free for students, teachers, and parents. Through a program called Summit Basecamp, schools adapt personalized learning to meet the specific needs of their individual school populations. Between classes at Summit Sierra in Seattle, WA Making sure no child slips through the cracks is a key benefit to personalizing the student learning process. The Summit Personalized Learning Platform is heavy on analytics and real-time assessment, allowing teachers and students to pinpoint areas of need while avoiding wasted time rehashing mastered skills. Having each student work at their own pace can relieve the stress or stigma for those falling behind, which could have discouraged them from class participation, often leading to a further decline. Summit Sierra in Seattle, WA Students might initially find the freedom challenging. However, unlike the freshman year of college, they can adjust to self-motivation while safe at home and with parental support. Educators also face some adjustments, but rewards soon follow. Preparing students for a successful future is the end goal for this or any personalized learning platform. “We want to make sure students are connecting their long-term goals with their daily actions; who they want to become should connect with what they want to be about, in school today,” says Choi. Using this platform, students can set goals and record their work; teachers, mentors, and parents can all join in to support the students to make sure they are on the path to meet their goals before it is too late. SUMMIT BASECAMP PROVIDES PARTNER SCHOOLS WITH A NUMBER OF SUPPORT RESOURCES. Unlimited access to the Summit Personalized Learning Platform, the online tool that helps power the personalized learning classroom, so teachers and students can create and follow learning plans and track progress toward goals. Complete curricula for English, math, science, and social studies for grades 6-12. Receiving the “gold stamp” from SCALE at Stanford University, this project-based curriculum is teacher-created, standards-aligned, and customizable. It includes nearly 200 deeper learning projects and over 700 “Playlists” (libraries of learning content) and assessments. Ongoing support and mentorship to help implement and adapt personalized learning for each school, including best practices from Summit Public Schools and other schools currently in the Summit Basecamp program. A “community of practice” that brings together teachers and administrators from across the country, doing the same work, to share experiences and ideas.